Whitepixel is an open source (GPLv3) GPU-accelerated password hash auditing software for AMD/ATI graphics cards. It serves the needs of law enforcement agencies specialized in high-tech crime and penetration testers. 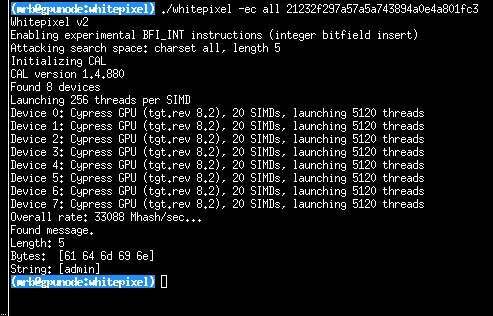 It is currently the world's fastest single-hash MD5 brute forcer: whitepixel achieves 33.1 billion password/sec on 4 x AMD Radeon HD 5970 (see detailed hardware description). Below: performance comparison against various tools with as many of the fastest GPUs they each support. Below: performance comparison against various tools with the single fastest GPU they support.